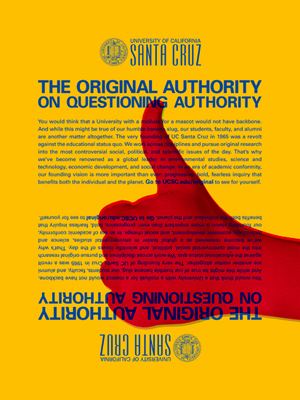 A full-page ad featuring UC Santa Cruz appeared in Time magazine and the New York Times Magazine last week. The same ad is scheduled to appear in Business Week this week and The Atlantic in November. "These ads speak to UCSC's core identity as a place with an unshakable commitment to students and to the fearless, bold inquiry that propels pathbreaking research," Chancellor George Blumenthal told the campus in a note after the first ad appeared in Time. Today's competitive environment for the best students, the best faculty, and for philanthropic support has prompted many universities to advertise what is special about their campus. The ad's headline reads: "The original authority on questioning authority" followed by copy: "You would think that a University with a mollusk for a mascot would not have backbone. And while this might be true of our humble banana slug, our students faculty, and alumni are another matter altogether." "Our students learn how to think, not what to think," Blumenthal said. "We care about social justice and the health of our planet. These qualities define UCSC's distinctive culture, and these ads are part of an overarching campus strategy to raise awareness and build our national profile in an era when fundraising is more important than ever."